1. 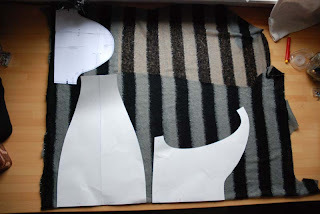 Fabric placement: put the two new pieces on the fold, choose you sleeve length. 2. Cutting. These are your pieces. 3. Start sewing. Set in the sleeves. Setting them in flat (before sewing the side seam and sleeve seams) tends to be a bit easier. When pinning the sleeves, the notches for the shoulder on the body and sleeve are really useful, but they don't in this fabric. 5. Sew short end of edging. 6. Fold in half right side out. 7. Pin to body. 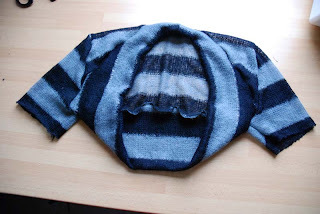 Put the seam at the center back of the neckline and stretch the edging evenly to fit the body. Sew. 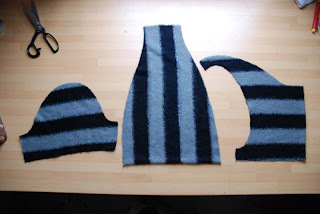 Any knit or jersey can be used for this pattern, however the amount of stretch and/or drape can vary enormously with each fabric, which is something you should always keep in mind when considering the combination pattern and fabric. 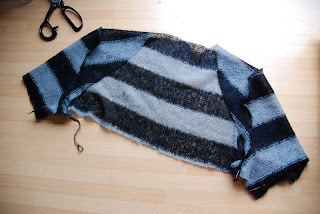 For this project, it's Ok if the fabric is a bit bulky, but it shouldn't be too drapy. 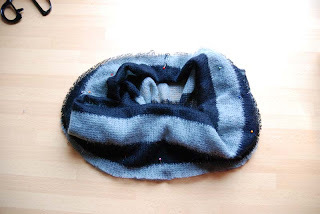 Also, I used a serger here but of course you could also make it on a sewing machine, using a stitch appropriate for stretch (if you don't have 'official' stretch stitches, use a small zigzag). 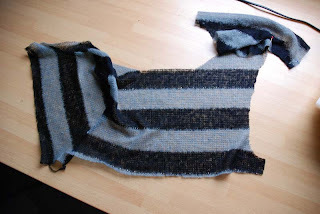 Jersey won't ravel but more open knits, like this one, will. Once again, good luck sewing! Oh, thank you so much for doing this! After reading this post I know I would have NEVER figured it out on my own. 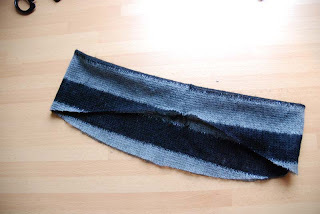 I do have quite a bit of leftover knit fabric, so if I make one, I'll definitely let you know. Thanks again, Lisa. 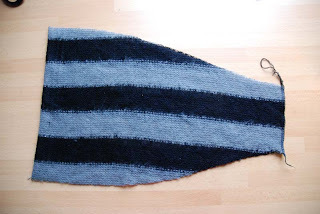 Oooh, I might have found a use for my leftover Paul Smith knit, black and white stripes with a sparkle... thank you for uploading!